Last summer I attended a three-day workshop in Hamilton. It was the best professional development opportunity I have had in my 20-year teaching career. Teachers often take workshops during the summer, but Teaching and Learning with Monarch Butterflies is unique in its content and outreach. The workshop is a combination of classroom and field experiences, led by Eric Mollenhauer of the Educational Information and Resource Centre (EIRC), a New Jersey public agency, and a team of teachers from New Jersey and Ontario. This workshop has a global impact, involving Canada the United States and Mexico. In Ontario, we endeavour to deliver enduring lessons to our students. The story of the monarch butterfly is one such lesson. As Eric Mollenhauer said, C£We, as humans, learn through stories; the amazing journey of the monarch is one great story. The monarchs that fly north to Ontario in the summer may be the great-great-grandchildren of the original ones, which flew south in the fall. At 4,000 km they have the longest migration of any insect in the world." The living science centre was an example of what we can create in our own classrooms. Each table was set up with an inverted tomato cage encased in black netting with several monarch chrysalises hanging from threads near the top. Inside the cage was a water bottle stuffed with fresh milkweed, the monarchs’ favourite food. 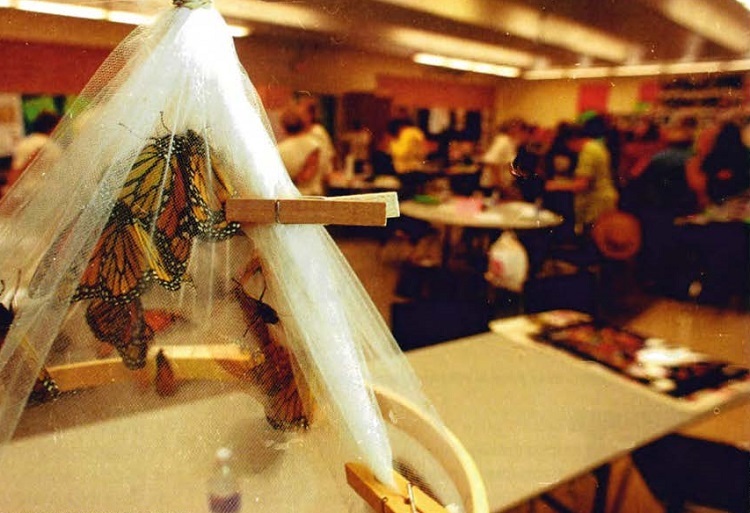 On the first morning of the workshop we heard an enthusiastic cry from one table: “Emerging!” All 50 participants and 13 teachers gathered around to witness an adult butterfly emerge. Wet crumpled wings unfolded and enlarged before our eyes as a miraculous metamorphosis took place. As the adults emerge, they are removed to a roomy net with fresh coneflowers pinned inside. As well as being offered this natural source of nectar, the butterflies are fed sugar-water nectar each morning. This feeding process required some instruction from the experienced staff. You gently hold the butterfly with wings folded and ensure the proboscis (feeding tube) is extended into the nectar. The insect drinks this nectar for a minute or so, and then rolls the proboscis up, indicating it is full. Occasionally one would escape and have to be netted and returned to its home. On the final day, we released the butterflies, one by one. We applied nectar to our hands or noses to provide a final feeding for the migrating butterflies. The sensation on the nose of the tiny, suction-like feet of an insect about to travel to Mexico was humbling. Learning how to create a butterfly garden at our own school was an important part of the workshop, with several experienced teachers addressing the creation and maintenance aspects and the potential teaching opportunities when you have a garden at your school. We spent one afternoon in the field: it was an opportunity to identify tiny monarch eggs and larvae. We visited the Urquhart Butterfly Gardens in Hamilton created as a tribute to Dr. Fred Urquhart, a Canadian entomologist who pioneered the tracking of monarchs with tags. Back home in Grey County, I netted a male monarch to meet my students on their first day of school. A monarch caterpillar in my classroom created a chrysalis and emerged the last week of September. “It is a girl,” was the birth announcement on the PA. (The male has a single black dot on each hind wing; the female does not.) The children named her Sparkles. The Monarch Teacher Network is composed of (mostly JK-8) teachers who have received training in how to use monarch butterflies to teach a variety of concepts and skills, including our growing connection with other nations and the need to be responsible stewards of the environment. The network is sponsored by the EIRC and is growing in Canada. The workshop sessions included practical activities, and games. We viewed videos about the monarch and environmental concerns. We received various language, math, art and social study projects to see and try out. The volunteer teaching staff who had tested the projects in the classroom shared instructions and handouts. The workshop cost $60 and, considering the value of the books, videos and teaching resources, I have about $120 worth of materials to use in my classroom. The Hamilton Wentworth District School Board and ETFO provided funding. This year workshops are being held in Merrick- ville (south of Ottawa) on July 25, 26, 27 and in Kingston on July 27, 28, 29. For more information and workshop registration details visit: www.eirc.org+global connections. Or send your registration and cheque to: Monarch Canada Teacher Network Canada, 19 Cartwright St., Kingston On K17 1P3. Audrey Armstrong is a teacher with the Bluewater District School Board.